According to the North America Family Histories 1500 -2000 (The Groton Avery Clan), Abraham Avery was born September 12, 1764 to Jonathan and Preserved (Smith) Avery. He was their only son. Abraham is a descendant of the Avery’s of Groton. His 4X Great Grandfather was Christopher Avery and he descended as follows beginning with his father: (Jonathan, Abraham, Thomas, Capt. James, Christopher). Elizabeth was born September 8, 1766 to Moses Noyes and Hannah Selden in Lyme, New London County. She had seven siblings: Calvin Noyes, Moses Noyes, Eliakim Noyes, Elias Noyes, Seth Noyes, Mindwell Noyes, and Eunice Noyes. Elizabeth died on February 17, 1837 at the age of 71 and is buried in the Old Stone Cemetery in Niantic, CT.
1800 – Abraham Avery is listed in the 1800 Census Report living in Lyme, New London County with 7 household members: 3 Free White Males under Age 10, 1 Free White Male between age 26 and 44, 1 Free White Female under Age 10, 1 Free White Female between age of 10 and 15, and 1 Free White Female between the ages of 26 and 44. Jonathan Avery is listed again as a neighbor. 1810 – Abraham Avery is listed in the 1810 Census Report living in New London County > “Second Society”, with 9 household members: 1 Free White Male under 10, 1 Free White Male between age 10 and 15, 2 Free White Males between age 16 and 25, 1 Free White Male 45 and over, 1 Free White Female between age 10 and 15, 2 Free White Females between age 16 and 25, 1 Free White Female between age 26 and 44. 1830 – Abraham Avery is listed in the 1830 Census Report living in New London County > Lyme, with 10 household members: 1 Free White Male age 15 thru 19, 1 Free White Male age 13 thru 39, 1 Free White Male age 60 thru 69, 1 Free White Female age 30 thru 39, 1 Free White Female age 40 thru 49, 1 Free White Female age 60 – 69, 1 Free White Female age 90 – 99, 1 Free Male Colored Person age 10 thru 23, 1 Free Male Colored Person age 36 thru 54, 1 Free Female Colored Person under age 10. The census reports at the time did not list addresses but based on the neighbors recorded, it appears that Abraham lived in the same location which is most likely somewhere on the same property that was taken over by his son Thomas Avery on Society Road in East Lyme, CT. 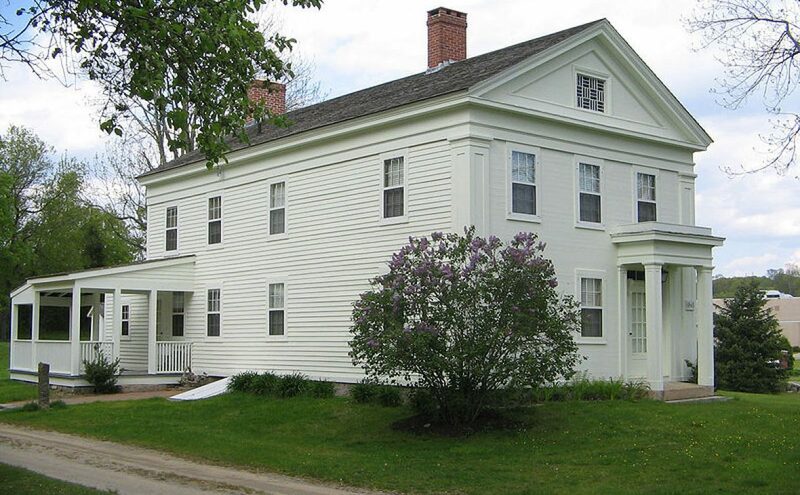 According to the information provided in the National Historic Register application for the Thomas Avery House, Jonathan Avery, Abraham’s father, purchased 4 parcels of land from Daniel Smith in 1751 and the Avery clan was actively farming at this location since at least that date. 1793 – Abraham Avery purchased 28 acres from Joseph Poquiantup. 1799 – Abraham Avery purchased 14 acres of land from Sarah Poquiantup, Aaron Poquiantup, Solomon Poquiatup and Lucy Poquiantup all of the Niantic Tribe of Indians. Abraham died on October 4, 1834 at age 71 and is buried in the Old Stone Cemetery, in Niantic, CT.
Abraham Avery’s will was found in the following database: Connecticut, Wills and Probate Records, 1609-1999. Hartford > Old Lyme District > Probate Packets, A- Chadwick, D, 1830-1880. Estate during the time that she may remain – in my widow. Item I give unto my two daughters Mary and Hannah each the sum of One hundred dollars and all my household furniture to be equally divided between them. Item I do give unto my son Thomas Avery the use of my real estate, cattle, horses, sheep and farming tools (provided he pays the legacies as above bequeathed. Lastly, I do make and constitute my son Thomas Avery Executor of this my last will and testament. In witness whereof I have set my hand and seal this 26th day of June in the year of our Lord 1834. This was great to read. So much detail to the family holdings.